Agatha Christie’s The Mousetrap is back on tour in 2019/ The Mousetrap UK tour stars Gwyneth Strong. Sixty seven years after it opened in London’s West End, Dame Agatha Christie’s The Mousetrap will undertake a national tour starting in January 2019. 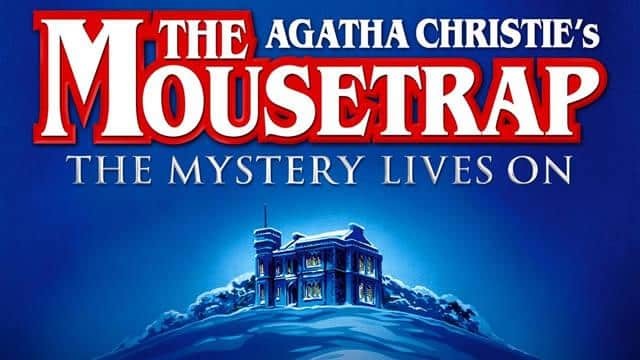 The Mousetrap is Agatha Christie’s most famous stage whodunnit and sees a group of people in a country house cut off by snow. The gathering realise that there is a murderer in their midst and the hunt begins to find the identity of the killer. Gwyneth Strong will perform as Mrs Boyle for 24 weeks through to Norwich, with further star casting to be announced. The cast also includes David Alcock (Mr Paravacini), Geoff Arnold (Detective Sgt. Trotter), Nick Biadon (Giles Ralston), Lewis Chandler (Christopher Wren), John Griffiths (Major Metcalf), Harriett Hare (Mollie Ralston) and Saskia Vaigncourt-Strallen (Miss Caswell). Gwyneth Strong is best known for her role in the BBC sitcom Only Fools and Horses in which she starred in the role of Cassandra. The role gained Gwyneth mainstream recognition and she appeared in the hit comedy show as well as several Christmas specials between 1989 and 2003. More recently, she joined the cast of EastEnders in the role of Geraldine Clough. Other television credits include The Great Train Robbery, Silent Witness, Casualty, Doctors and Murder in Suburbia. Gwyneth appeared in the UK tour of Our House, in which she played Kath Casey. Her stage credits also include Stand (Oxford Playhouse/Battersea Arts) Monkey Bars (Unicorn Theatre), A Round-Heeled Woman (Aldwych), When You Cure Me (Bush Theatre), Ancient Lights (Hampstead Theatre) and Care (Royal Court).